For analysis 3 particular national holidays were chosen: National Commemoration Day for the Accursed Soldiers Day (March 1st) which is the normal day of work; the national holiday – the Constitution Day (May 3rd), which is officially celebrated and free from work from 1989; and the commemoration day – the end of the WW2 (May 8th), usually it is a regular week day, however this year it was Sunday. The first clue from the TV schedule observation is that in every mentioned case celebration was not limited to one particular day, before the national holiday and later on some positions of programming were subsequently broadcast as new or repeated from the celebration day. The second notion is connected with the origin of celebration – first two of them are relatively new in Polish reality of the 21st century, and the third one – was celebrated since 1945, however on different day of May (9th). It is worth mentioning that Polish Independence Day is celebrated on November 11th, since transformation era begun. 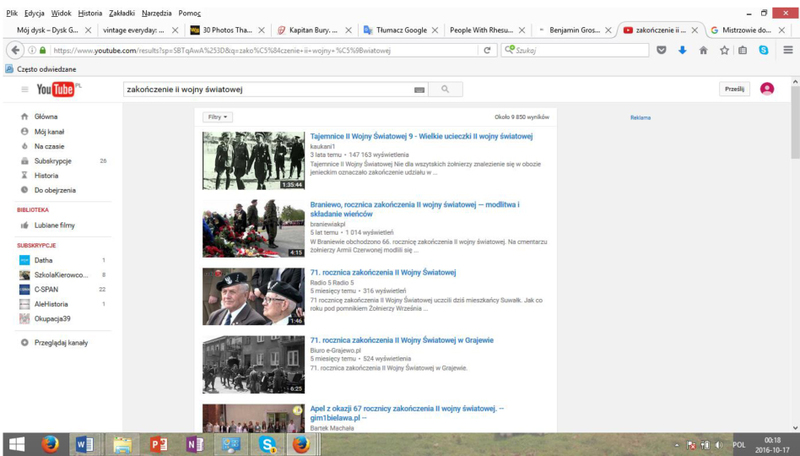 The same happened with the soldiers’ day, the Polish Army Day – August 15th, earlier – it was October 12th. Nowadays the victory on the Red Army in 1920 is celebrated, s.c. A Miracle on the Vistula River (Cud nad Wisłą); previously – the anniversary of the battle of Lenino, during which the Polish Army formed in the USSR had its “baptism in fire”. The last change is not so popular among soldiers who remember the Polish People’s Republic era. They are disappointed because the effort of the Lenino battle now is forgotten, the Army which was formed in the USSR is treated as dependent to the Red Army or at least, to the Polish socialist government. The Accursed Soldiers receive a lot of interest in real life and in the interne, huge number of articles, movies, and comments are devoted to evaluate and honor their fight. However, not always the comments are in the “Cześć i chwała bohaterom” style. Some sites and comments deal with the controversies on the deeds of chosen participants of this guerilla movement. For example, scientific interpretations, opinions and comments on the military deeds of kpt. Romuald Rajs, “Bury”, one of military leaders of at Podlasie, are deeply diverse. In some reports “Bury” is treated as hero, however, some facts are still not so clear; some historians and Podlasie citizens accuse him of burning two villages, together with innocent citizens. Polish right and left political researchers and politicians quarrel on this topic; the word “crime” is used in this discourse. The conflict was heated in February 2016, by a planned commemoration of the Accursed Soldiers (including “Bury”) in Hajnówka. The 1st Hajnówka March for the Accursed Soldiers (1 Hajnowski Marsz Żołnierzy Wyklętych), was organized on February 27th by the extreme right organization ONR, a month after the 70th anniversary of the victims of supposed “Bury’s” and his soldiers action. A lot of comments and the internet users actions (like sending the posters, calling on Facebook to sign a protest etc.) 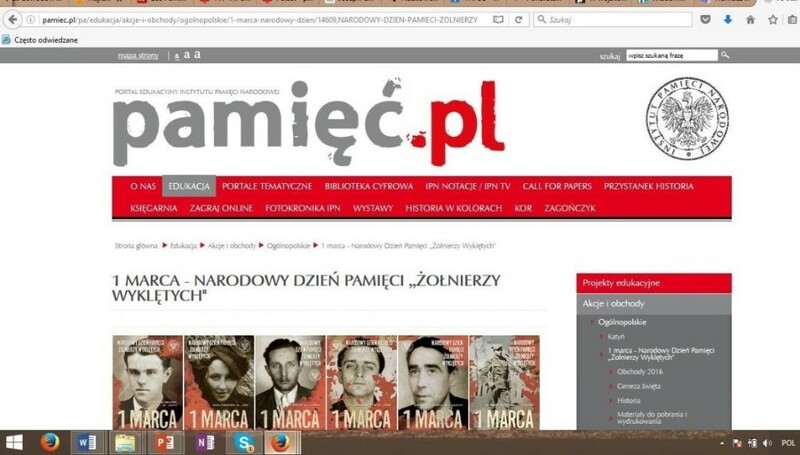 were rooted in the collage produced by weekly magazine “Newsweek”, which suggests that President Andrzej Duda supports the ONR celebration, what occurred a false information. However , just after popularization of the collage in the net people start to produce their own mems, posters and put a lot of comments full of hate toward the Polish President. Few days later, after the clarification of the background of collage, the protest expired, however, nobody said “we’re sorry” for that mystification, and so many harsh words and opinions were said on the basis on the unjust and unproved information and photomontage. In fact, this trolling action was a political game, and name of the Accursed Soldiers was used to discredit the President, to diminish the bravery and sense of anticommunist underground fight, and to intensify the conflict in society (on the base of evaluation of the anticommunist guerilla). Fig. 1. The print screen from official site of the Institute of National Remembrance (IPN) for March 1 celebration. Simplifying the rhetoric of discussion, one can identify two main groups in opinion about the Accursed Soldiers, admirers and haters. Between these two polarized attitudes manifested in opinions, posted pictures, mems etc., there are small groups: 1) of the “reluctant” to the name of the Accursed Soldiers internet users, 2) those who always try to find all the information, or 3) those who are abstaining from any evaluation, or/ and set the rational tone to the discussion. Of course, the detailed analysis of rhetorical arguments and strategies will show more diverse milieu of this discourse participants. mystery covered the topic, characters, deeds of the Accursed Soldiers during the last 60 years. The topic was not present in typical history textbooks, neither in the public media discourse. Up to the 60s. of the 20th century the propaganda system in Polish People’s Republic created a vision of criminals who fight against the society, ordinary people, or who were traitors of our country. Work of historians is not completed, research is progress, sometimes scientists are also asked for their opinion, and “honest doubts” of researchers are also present in the popular discourse. However, the emotional aspects of social memory (admiration, anger, love/hate attitudes etc.) is a dominant feature of nowadays interpretations of the Accursed Soldiers fate. The holiday refers to the adoption by the Polish parliament (Sejm) resolution of the first modern constitution in 1791, it is called “Constitution of May 3”. The importance of reforms introduced by the “Great Sejm”, democratic solutions to some social issues were influential in Europe, despite the fact that it was adopted during the Partitions of Poland era. In the 20th century it had been celebrated since 1919, during the interwar period. However, after the end of the WW2, during the Polish People’s Republic era the celebration was not continued, instead, the May 1st was celebrated as the workers day. This holiday was introduced in 1990 anew, one year after the beginning of system transformation. May 1st is still celebrated as a public holiday, and actually, now May 2nd is also a sort of national holiday, “Flag day”. The Day of Polish Flag was introduced in 2004. So, in Polish social life the beginning of May is called “majówka”, for some Poles it is free from work (some companies decide to make May 2nd free, and during the whole tirade we can have a spring vacation). In 2016, May 1st was also celebrated as Easter in the Orthodox Church, and some celebrations were broadcast in TVP1, TVP2, and regional channels of TVP3. In the night May 2/3 was the beginning of the 3rd Silesian Uprising (1921), which goal was to connect Silesia to Poland after the WW1. This year, Wojciech Korfanty, the leader of this military action (“dyktator”), was commemorate in one documentary and in the live discussion in the studio (Warto rozmawiać) broadcast by TVP1 (see the table below), and some positions in the local programming in TVP3 Katowice were devoted to the history of Śląsk. This topic, more than 200 year constitution, is not so eagerly discussed as the topic of the Accursed Soldiers or the WW2 issues. A lot of information in media stressed the modern, unique character of this legal act. Polish Constitution of May3, 1791 was presented as the first in Europe such an act. What is important, the nowadays politics interfere with the national pride day. Political controversies on the Constitutional Tribunal, the conflict between the ruled party and the opposition on the role of the Tribunal in democracy, etc., accusation of violation the law by the Polish government occurred during the preparation to the celebration day, and later as well. One embarrassing mistake committed by Ryszard Petru, a leader of one of the opposition party, Nowoczesna, was a good source of jokes, mems etc. He accused the government of not respecting the Constitution of May 3, “our pride for 200 years”. Fig. 2. Print screen from photo gallery in Gdańsk, an occasional illumination for May3. In the internet materials a lot pictures were put, snapshots and graphic referring to the celebration in the different cities. Comments in such a occasions do not concern history but the city decorations, politicians behavior, etc. The internet users commented also some facts from private life of the authors of the Constitution of May 3, some secrets are revealed in the shared stories. In some comments the users complain because of too many national holidays and vacations. The discussions do not go into the deep of history, and easy go astray. When the Second World War ended? The answer is not so obvious, concerning the end of military actions on the whole territories involved in fights. In Poland, during the Polish People’s Republic era, the main celebration was on May 9, just like in the USSR. After the collapse of the previous system, V-day is celebrated on May 8. The end of the WW2 means the incorporation of Poland to the communist bloc. The end of war did not mean peace and freedom, some Polish citizens did not accept forced subordination to the USSR, and formed the anticommunist military underground (it was mentioned previously). Military underground was active to 1963, the Soviet soldiers stayed in Poland to 1993. In opinions of some Poles, the end of war is prolonged to the end of communism. However, some issues concerning these facts are still vivid, such as the monuments of the Soviet soldiers, treated by propaganda of the PPR era as liberators, and after system transformation hidden facts about the USSR invasion in 1939, and the postwar Polish-Soviet relation are revealed. In the media discourse these topics are also discussed. The material gathered on this topic is huge, however not so diverse, as the interpretation of the Accursed Soldiers achievements. However, it seems that more materials are connected with the beginning of war. Synthesis of the content, official or private is almost impossible in this context. Some controversies are connected with the commemoration of the Soviet soldiers killed during this war and buried in the separate graveyards in some Polish cities. A new law about the “de-Sovietisation” of the public space had been introduced this year, and on the bases of it, some street names connected with Soviet Union, communism, etc. should be changed, and signs such as a red star or sickle and hammer should be removed. This generates some discussions, and the moral problem of the right to commemorate the dead in the way they wished. On YouTube the spectrum of the movies spread from the official productions of the television stations, Polish and foreign, to the reports from the celebrations at schools (and obviously, the less popular). The latter are not so popular, and not widely commented. To some reports, such as from the official ceremonies with the members of government, possibility of commenting is blocked. In some comments and discussion under the popular movies on the end of WW2, Polish problems after the war were mentioned. Despite the fact that some of the participant in discussion focus on the technical problems such as bad spelling of German names, the criticism, sometimes in very rude manner, is often devoted to simplifications made by the producers of the movies, or to the historical decisions made by the military and political leaders. 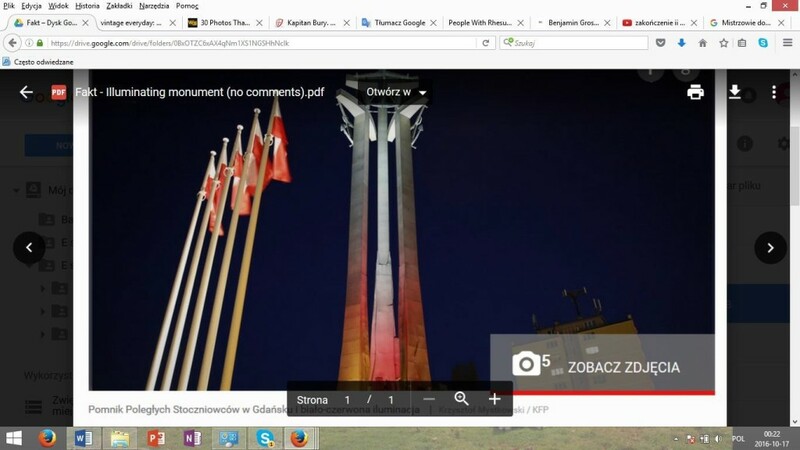 Print screen from photo gallery in Gdańsk, an occasional illumination for May3.